Roast red pepper over grill on gas flame for 15 minutes, turning over or in 400 oven for 40 minutes, or until blackened and soft. Peel and seed pepper, chop coarsely. 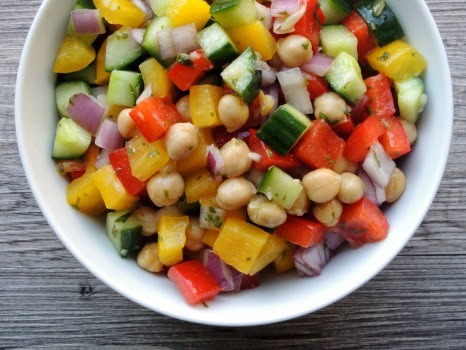 In bowl, combine red pepper, chickpeas, cucumber, onion, parsley and basil. 3.In small dish, whisk together lemon juice, olive oil, garlic and salt and pepper to taste; pour over salad and toss lightly. Cover and refrigerate for at least 15 minutes or up to 1 day. Makes 3 servings for lunch.